History can be told in terms of secret passageways, hidden rooms, and obscure tunnels. Wars have been won and lost by them, coup d'états sprung, and entire countries altered thanks to a well-placed nook or crannie. There are also plenty of modern-day uses, as you'll see below—from drug smuggling tunnels in Tijuana to hidden doors that protect your most valuable wines. Check out 20 of the best, below. Some of the oldest hidden passageways are found in the pyramids of Egypt. Below is the Cheops, the oldest and largest of the three pyramids in the Giza Necropolis. On the right, we see a long tunnel leading upwards to the entrance to the burial chamber. Here's a disguised entrance to a hidden reading room in the National Library in Vienna, Austria. The Củ Chi tunnels in Vietnam were used as hiding spots during combat. They also bore communication and supply routes, hospitals, food and weapon caches and living quarters for guerrilla fighters. Another secret room at the former Ford Country Day School, a 30,000-squarefoot Tudor mansion in Los Altos Hills, California. A hidden passageway leads to this bunker restaurant in Lviv, Ukraine. The restaurant is dedicated to the Ukrainian Insurgent Army. Here, we see the entrance to an underground Hezbollah warehouse. In 2006, during an IDF operation in the central sector of southern Lebanon, Israeli soldiers found the bunker filled with weaponry and rocket launchers hidden under trees. This 220-yard tunnel, in Tijuana, Mexico, crossed the border beneath the US and Mexico, and was widely used by drug smugglers. Its entrance? The cabinet underneath a bathroom sink inside a warehouse in Tijuana. It was raided in 2012. Plenty of average people want the security and privacy of hidden rooms, too. 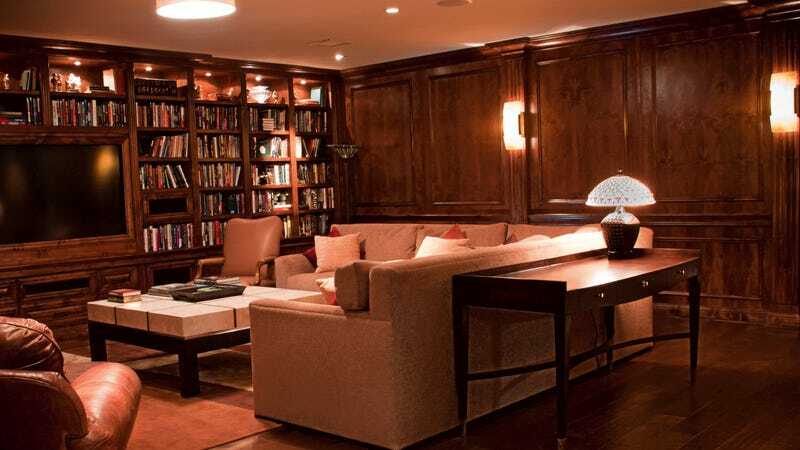 This billiards room has a secret passageway created by Creative Home Engineering, a company that specializes in custom construction. 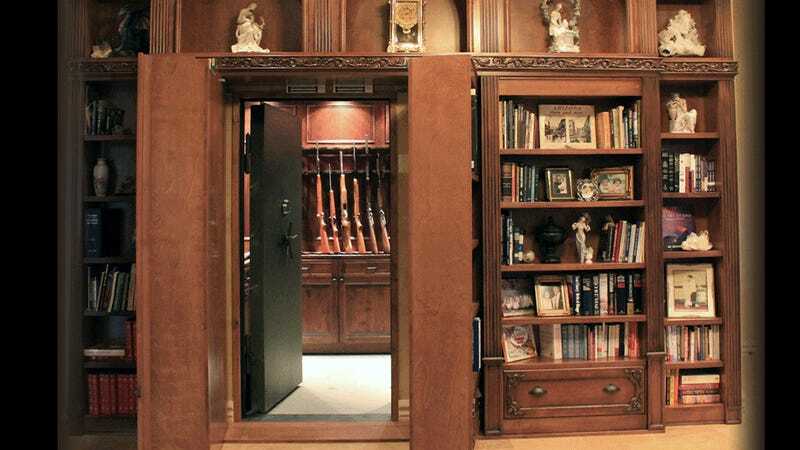 This bookcase leads to a weapons storage room—it was also designed by CHE. Bookshelves? No, that's a disguised door. The wood paneling makes for a perfect disguise for this hidden door. Is that a stone wall? No, it's a stone door that leads to a (presumably very valuable) wine cellar. This ornate mirror hides a vault. Just another stone wall? No, that's another stone door. These bookshelves swing open to reveal a small, Harry Potter-esque room. Yet another door hidden behind a wood panel. This garage, on the bottom floor of a historic Victorian apartment on Oak Street in San Francisco's Upper Haight district, isn't exactly hidden. But it is very neatly disguised, thanks to a series of bay windows. Inspired by library racks that also use this system, these rolling shelving units expand into workstations. 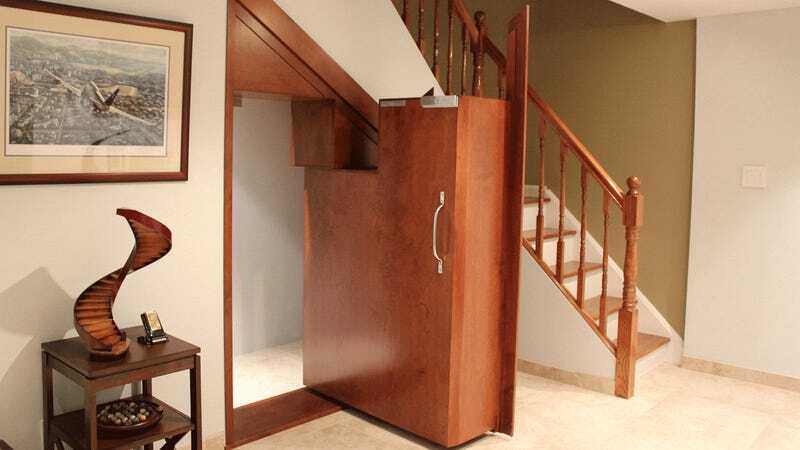 The Hidden Doors company made this hidden door—which leads to a home gym. Do you have a favorite secret passage? Show us in the comments!